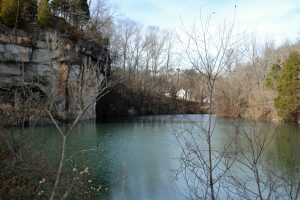 The Limestone Quarry located off Main Street and Metcalf Drive is a lovely 4 acres. In the 1940s as they were mining for limestone, workers hit a spring. Local legend held that workers were barely able to get out before the area flooded, and they left their equipment behind. However, in 2013, three scuba divers were permitted to explore the area and they found no man-made structures left from the mining operation.